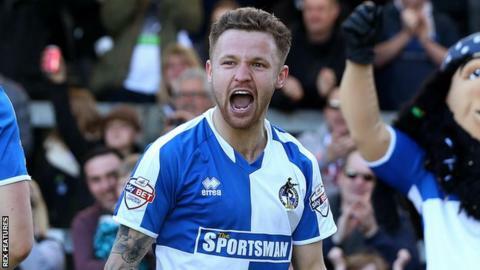 Bristol Rovers moved back into the League Two play-off places with a comfortable win over Crawley Town. Matt Taylor gave Rovers a second-half lead with a powerful header from Liam Lawrence's corner. Lawrence turned from provider to scorer 22 minutes later as he struck home an exquisite 25-yard free-kick before Taylor netted a second header soon after following Chris Lines' corner. Cristian Montano could have added a fourth, but Callum Preston saved well. Rovers move up a place to third in the table on goal difference following Plymouth Argyle's 2-1 loss at Devon rivals Exeter City, while Crawley stay in 16th place. "We came to a team who are in form and have momentum with them and have got a goalscorer who has 25 now and we added to our own downfall conceding the goals we did. "It was three set-pieces and we normally pride ourselves on being a decent set-piece side. "I'm proud of the group and we've had so many things that have hindered us this year, for example the numbers, the training ground and I am not making excuses but it's been a tough year. "I am just pleased after 40 games hopefully we are not near that bottom two and we haven't been in that bottom two all season." Match ends, Bristol Rovers 3, Crawley Town 0. Second Half ends, Bristol Rovers 3, Crawley Town 0. Daniel Leadbitter (Bristol Rovers) wins a free kick on the left wing. Attempt saved. Gwion Edwards (Crawley Town) left footed shot from outside the box is saved in the top centre of the goal. Corner, Crawley Town. Conceded by Daniel Leadbitter. Substitution, Bristol Rovers. Oliver McBurnie replaces Rory Gaffney. Corner, Bristol Rovers. Conceded by Josh Yorwerth. Attempt blocked. Cristian Montaño (Bristol Rovers) right footed shot from outside the box is blocked. Goal! Bristol Rovers 3, Crawley Town 0. Matty Taylor (Bristol Rovers) header from the left side of the six yard box to the bottom right corner. Assisted by Chris Lines with a cross. Corner, Bristol Rovers. Conceded by Callum Preston. Attempt saved. Cristian Montaño (Bristol Rovers) left footed shot from outside the box is saved in the top left corner. Substitution, Bristol Rovers. Cristian Montaño replaces Liam Lawrence. Substitution, Crawley Town. Simon Walton replaces Frankie Sutherland. Goal! Bristol Rovers 2, Crawley Town 0. Liam Lawrence (Bristol Rovers) from a free kick with a right footed shot to the top right corner. Corner, Bristol Rovers. Conceded by Frankie Sutherland. Frankie Sutherland (Crawley Town) is shown the yellow card for a bad foul. Foul by Lee Brown (Bristol Rovers). Shamir Fenelon (Crawley Town) is shown the yellow card. Attempt missed. Sonny Bradley (Crawley Town) left footed shot from the centre of the box is too high. Corner, Crawley Town. Conceded by Mark McChrystal. Substitution, Crawley Town. Shamir Fenelon replaces Roarie Deacon. Attempt missed. Rory Gaffney (Bristol Rovers) right footed shot from the centre of the box misses to the right. Billy Bodin (Bristol Rovers) wins a free kick in the defensive half. Liam Lawrence (Bristol Rovers) wins a free kick on the right wing. Rory Gaffney (Bristol Rovers) wins a free kick on the left wing.